For Kitchens, Bathrooms ... for your home, for your life. Everything that we do is just for you. We design your cabinetry to fill your needs and to fit your home. We build it for your life. We wouldn't do it any other way. For over 15 years we have been gathering the finest skilled craftsmen around. 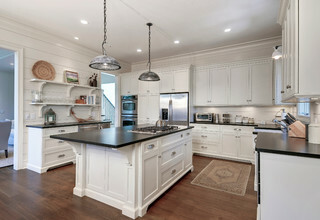 We love to design and build custom cabinetry. Before we do, we take the time to learn what you want, need and what fits your home.